Life is extremely difficult for most of the people nowadays, with nine to five jobs, bosses breathing down the employee’s neck, people need some personal time to cool off and recharge which will make it easier to start afresh. And what could be a better refreshment than camping, absorbing the fresh air, listening to the sounds of nature for a change, spending time with family or alone? And making your choices of equipment’s easier we have brought to you the list of the best affordable and comfortable sleeping mattresses preferred by campers. This Intex Twin Airbed is made of vinyl and it contains a double coating of wave beam interior. The top of this mattress is waterproof which is covered with a cluster of vinyl beams, and it also has built-in pillows for extra comfort. This mattress also comes with a built-in pump that inflates it within only three minutes. It raises up to 16.5 inches after inflation. This mattress has a weight of approximately 11.5 pounds, and it measures to 39 inches width and length 75 inches. This mattress comes with the whole package of an Ac power cord, a shoulder strap, and a duffel bag which makes it easy for transportation and storage. This unique foam mattress can be utilized in various ways as a mattress obviously, even as a chair and cushion too. It is a trifold design, and extremely lightweight weighing approximately 16 pounds and has attached handles which makes it pretty easy to carry around. The foam body is covered with a waterproof mattress protector made of soft jacquard bamboo. The mattress protector has a zip, it can be removed and washed. If you are planning for a long camping trip then this mattress is suitable for you, it will cater to your needs proficiently. This is a lightweight, sturdy, PVC-free airbed mattress which is made from thermoplastic polyurethane (TPU) and coated with phthalate. This mattress has a high resistance and is free of leaks. The mattress comes with a battery powered pump is used to inflate it quickly. It has valves situated in them which makes it easy for the user to deflate and inflate it as per their choice. The TPU makes this mattress pretty lightweight and can be carried everywhere easily. You can purchase this airbed mattress from Amazon. These mattresses come under the pricier range, but there are a lot of people suffering from back problems and neck problem, and for them, this mattress will be of extreme help. They can not only enjoy their camping holiday but can also do it painlessly and comfortably. This mattress can be easily carried and is extremely lightweight. You can buy memory foam mattress from urban ladder, pepperfry, and Amazon. There are a lot more different brands out there for mattresses in the market but these are some handpicked ones. 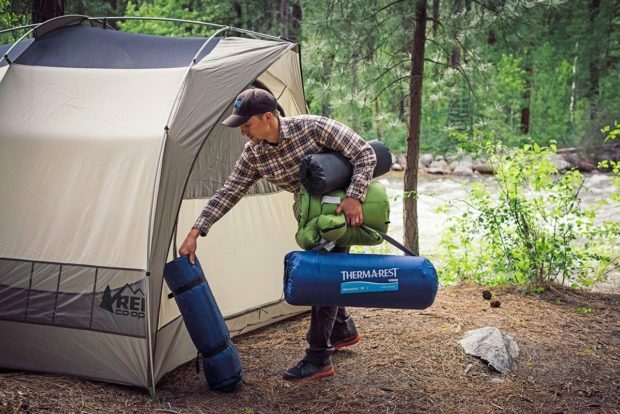 Camping is a relaxing activity people should not stress over simple matters like buy mattresses, and that is why we presented you with these helpful suggestions.